The Court of Arbitration for Sport (CAS) provides international sport with a jurisdictional institution capable of settling all legal disputes relating to sport. 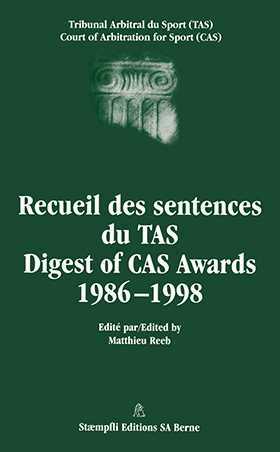 Founded in 1984, the CAS is currently the only international institution specializing in the resolution of sports disputes. Its decisions are equivalent to the judgments of state courts. This compilation is aimed at a wide readership. Those who practice law and sports organizations will find specialized judicial practice in this work and will certainly see within it the foundations of a rapidly emerging Lex sportiva.